"Bestseller Griffin delivers the goods with this perfectly gritty romantic thriller... Griffin sprinkles on just enough jargon to give the reader the feel of being in the middle of an investigation, easily merging high-stakes action and spicy romance with rhythmic pacing and smartly economic prose." "Be prepared for heart palpitations and a racing pulse as you read this fantastic novel. Fans of Lisa Gardner, Lisa Jackson, Nelson Demille and Michael Connelly will love Laura’s work." "FAR GONE will have you gripping the edge of your seat." 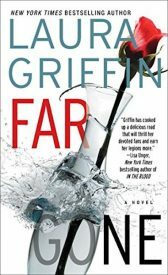 "FAR GONE has it all -- a smart, engaging heroine, a rocket-paced plot, and explosive non-stop action. Adding a dash of heady romance to the recipe, Laura Griffin has a cooked up a delicious read that will thrill her devoted fans -- and earn her legions more."